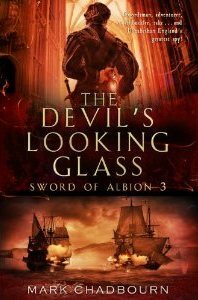 So that would be The Silver Skull in the US, or The Sword of Albion in the UK – same book, different title – just to avoid confusion. Also, I’ve just seen the cover for the US follow-up to this book, and it is truly remarkable. By Christian McGrath once again. Sweet! Any guesses on a release time? I liked the review as well. Using the word “funnest” in a literary critique deserves bonus points. First time I’ve had that adjective! I think the next book won’t be out till Feb 2011 because there are moves afoot to align US and UK publishing schedules. That makes sense. Though it means I won’t be getting it in November. I actually hope more publishers start arranging it this way. With technology the world has become so much smaller. For instance I just received an ARC for Adrian Tchaikovsky’s Empire in Black and Gold….due out in late March. It’s been out in the UK for well over a year…it’s all over the internet. It’s been on some of our To-Read lists for over two years. Don’t even get me started on Syke’s Tome of the Undergates….a US based author publishing in the UK, we’re not seeing that one here till sometime towards the end of the year…lol. So yeah, simultaneous publishing across the ponds would be a wonderful thing. Glad you all enjoyed the review! We do try. It’s been awesome finally getting UK based authors released in the US, but I do wish it was simultaneous as well. If I had any measure of patience, I’d just wait for the US release (well, the ARCs of the releases anyway), but I’m not patient. My import bill is high. Anyways. Can’t wait for more novels! Thanks, Mark, for stopping by our blog as well. We may beg you for an interview at some point–especially with your Dark Age novels coming out in a few months.